I was incredibly excited when I found out about this Daring Bakers challenge - I've always wanted to make a croquembouche. 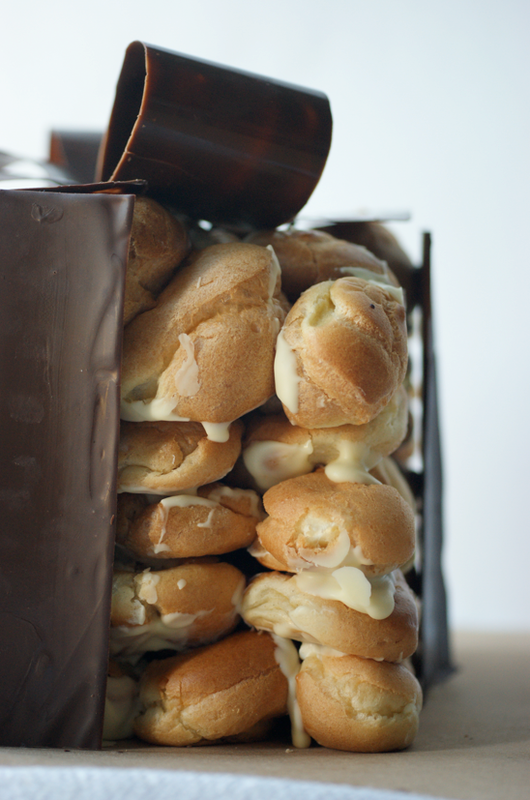 I've enjoyed working with choux pastry before and this time was no exception. I realise that I haven't exactly made a croquembouche in the traditional sense - another time - but I reckon the old pastry masters such as Carême would see this as an acceptable piece montée. I've been watching some wonderful programmes on 4oD on Carême called Glamour Puds - if you're in the UK I recommend them. The unusual and often architectural centerpieces he made with pastry inspired me to try and do something a little different with my piece montée. One of my flatmates informed me that if my rather heavy-handed description of croquembouche as 'sort of a mountain of profiteroles' was incorrect in any way, she might cry... so, really, I didn't have a choice - this had to be traditional profiteroles. I also felt anyway that pastry cream would be a bit too heavy for this summer weather, so I was very happy to use softly whipped cream. This was also why I went in for chocolate glazes and decoration rather than the caramel. As I was going for a traditional combination I've made before and not risking burns with spun sugar, I decided to get daring with the shape and chocolate decoration. The natural shift from a cone seemed to me to be to a cube. A cube that needs dressing up just made me think of a present... and so my present of profiteroles was born. 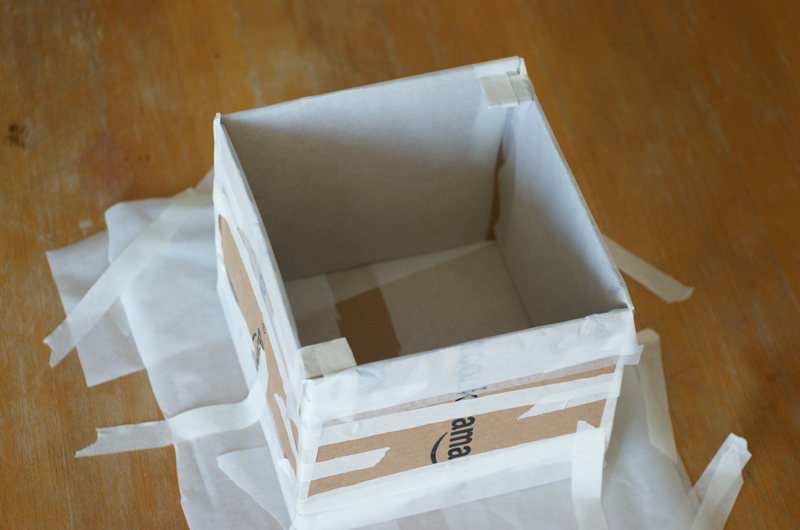 I made a cube mould from a few squares of cardboard cut from an amazon box, some greaseproof paper and liberal amounts of both sellotape and masking tape. It worked wonderfully - I just slid a palette knife around the edge after the completed stack had been in the fridge for half an hour or so and it just pulled easily off the top. 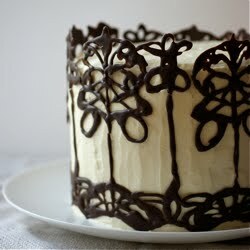 Since making my Beautiful and Damned cake, I feel a lot more confident working with delicate chocolate decorations. The no-need-to-temper chocolate I used for that came in handy again with this. 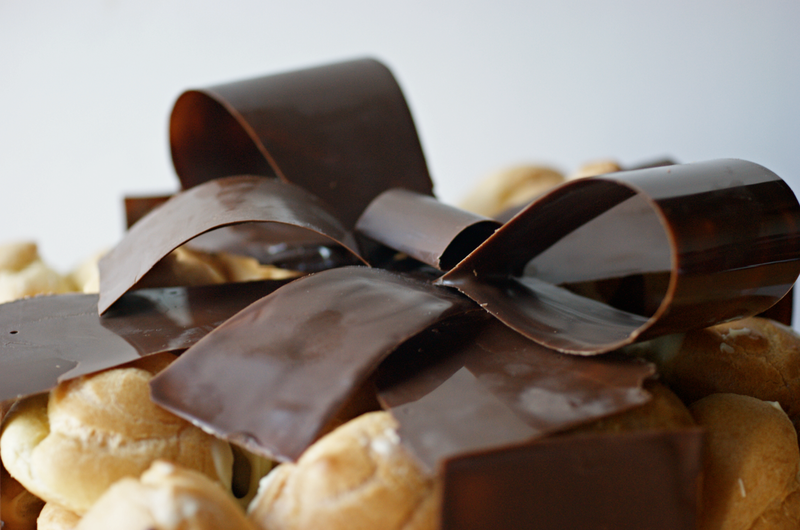 I decided to make 3D chocolate ribbons. I've seen people using thin plastic to make sheets and rings before so I decided to work with that idea to make these. I made a paper pattern of how I wanted my bow to look, then I bought some laminated plastic and cut it in the shape of my paper pattern. The melted chocolate was then spread over the sheets, pinned in place and then left to cool. The bow loops I made by attaching the two ends with a paper clip. The middle loop was kept in shape by a rubber band then just peeled off. The two loose ends I actually just held in shape with my hand in the freezer until they set, then put in the fridge. The flat sheets for the top and sides curled slightly as they set, which was annoying and meant that I had the spread, not shiny, side facing out. There were a few other problems and I managed to shatter one bow loop by mistake. There were also a few loose ends on the finished product and bits that weren't perfect, but for a first try it I was quite pleased. To complement the dark chocolate of the ribbon, I used white chocolate to glue the four outside 'walls' and the top. I also didn't egg wash the buns as I wanted a lighter look for them too. The core was stuck together with liberal amounts of dark chocolate. 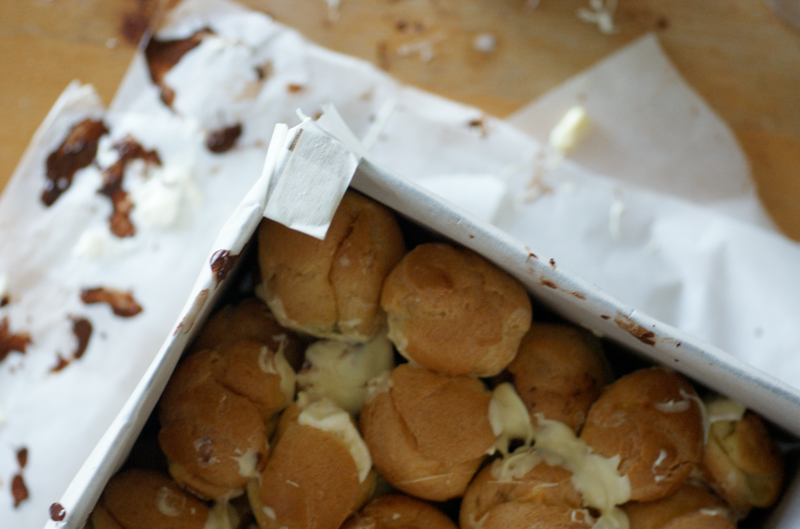 In the end I think the present comprised of about 100 profiteroles - I made three batches of the choux pastry. I used about a litre of cream to fill them. There was about 200g each of white and dark chocolate. In the end it fed 14 people, including some twice as we had more the next day. All in all, pretty epic. A wonderful challenge! What a beautiful version of the croquembocuhe. I'd be happy to receive this as a gift any day. amazing! congratulations on your challenge! I'm impressed with the chocolate ribbon. 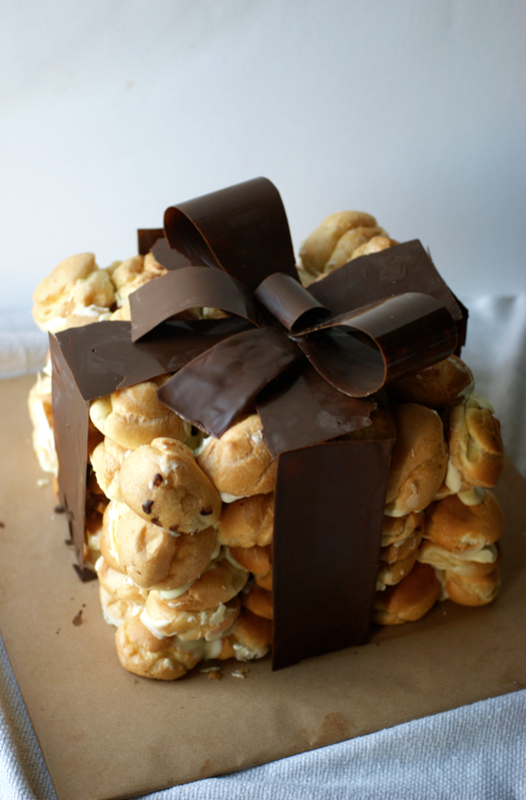 And the idea to make a present-shaped croquembouche is just soooo creative. Kudos! I always adore people who think outside the box (hehe) and yours is one of the most original croquembouches. Love love love it. Very creative and absolutely beautiful!! completely lovely and great how to pictures. Just fantastic. I love your interpretation. A good decision, also, to give the profiteroles a filling that's lighter than pastry cream. Beautiful chocolate ribbon, too. Really very whimsical, beautiful, original! You are very creative! 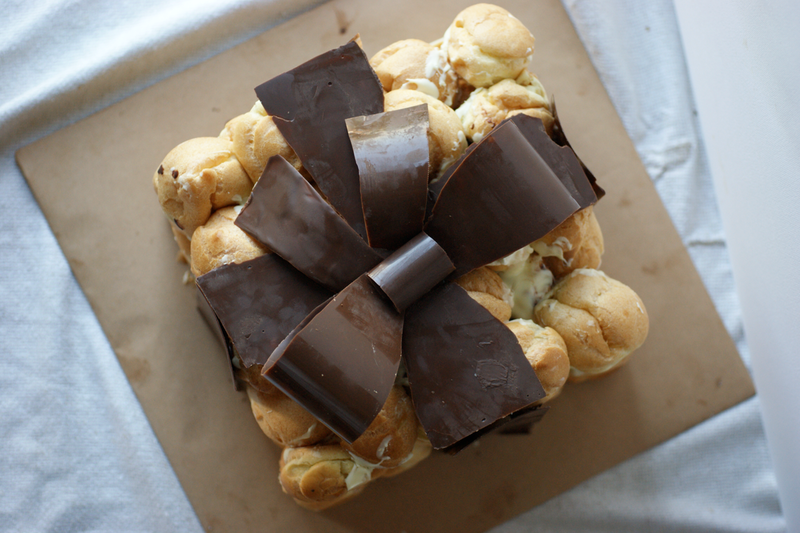 I love your Croquembouche gift box! The chocolate ribbon is perfect! Thanks for your lovely comment on my post! What a beautiful present. Love the chocolate bow. This is absolutely AMAZING! You are so talented. The bow is the best bit...wow! Amazing! That chocolate ribbon is inspired. That is the cutest thing I've ever seen!! Really creative. Did you hear that? It was the sound of my jaw hitting the floor. Wow! I mean WOW! This is amazing! Live your modern take on this dessert and your chocolate work is amazing! Wow!! Just fabulous! I love your creative take on this dessert. Beautifully executed, too. Great ribbon. Bravo! Goodness that chocolate ribbon is gorgeous! And so creative I never would have though to make it look like a present. Great job. OMG!! that is simply stunning!!! I would love to be gifted that!!! I love it! The gift box is a brilliant idea. This one is just brilliant!! It looks so beautiful and delicious!! Ehorabuena (congratulations in Spanish!!). Your's was one of my absolutely favourites!! This is simply stunning! This was my very first Daring Baker's Challenge, can't wait to see what's next! Ahh! This is the cutest thing ever! ABSOLUTELY FANTASTIC!! You are a genius girl. So impressed. Stunning!! I adore your presentation. What a cute idea! What a brilliant idea for presentation! It looks gorgeous! 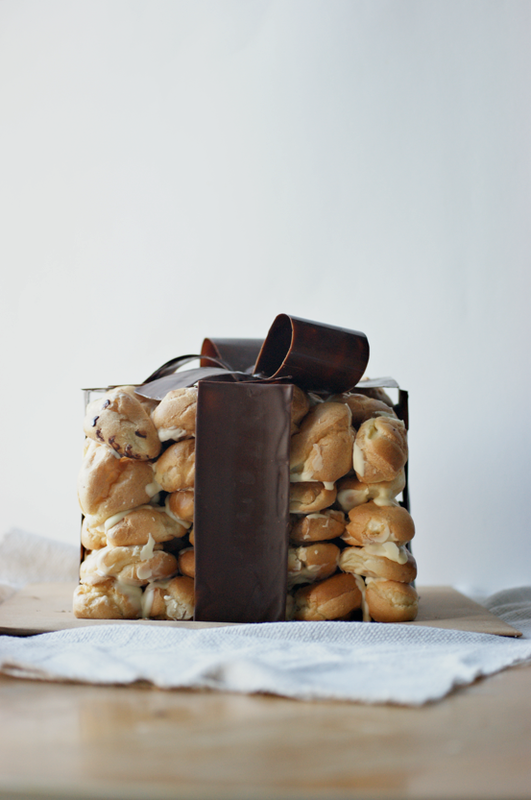 I think your croquembouche would be the best gift ever! It's gorgeous! I got the cookie cutters at Williams-Sonoma, and sadly haven't used them since the graham cracker DB challenge when I photographed them for the header. Gosh, I'm in awe! The chocolate ribbon, outstanding and the croquembouche as a gift.. ahh I would want one :)Very nice idea, and even more nicely presented. Well done! wow. wow wow wow wow wow. The chocolate bow is outstanding. wow. Oh yes please; I would LOVE a gift like this. Yours is one of the most novel and pretty piece montees I've seen! I want to make something similar one day, chocolate ribbons and all. WOW!! Well done on the challenge! I was going to compliment the way you thought outside of the box on this challenge, but I guess I need to change that to being amazed at how well you worked in one! So creative! I know I would be honored to get a gift like that!! Truly a work of art and a labor of love. Well done! Very cool idea! That bow is so cute, well done. Beautiful!!! How fantastic - a gift of profiteroles! A very unique idea! Great work. This is amazing! I can't believe that bow, it's fantastic. Oh my. This is fantastic! And so creative. I love the chocolate bow. The one time we tried to make croquembouche, the spun sugar devastated us. I would like to conquer it some day! Emma I love your croquembouche shape and the chocolate job...really lovely! I can image the happiness of your friends! It looks gorgeous and neat :) Good job ! Just... WOW. I LOVE THIS! Beautiful!! wow! I'm impressed. love the chocolate ribbon. amazing!. Ta présentation est absolument superbe! La forme et le magnifique ruban sont d'une rare perfection. Félicitations pour ton beau travail! Your present is stunning. It's such a creative idea and even though you explained how I still can't fathom creating that bow. WOW. did santa help you it looks so pretty !!! Oh My Goodness!!! This is ABSOLUTELY BEAUTIFUL!!! I envy your chocolate ribbon because I did not like working with chocolate in pastry school although the acetate strips weren't that bad. You did an Amazing job!! !